Originally from Colorado, Corey had the prototypical young musician's experience of playing in various ensembles throughout high school and college. After graduating from Vanderbilt University, Corey entered into professional life vowing never to "let the dust collect on my trombone". Thus, his musical adventures would begin in Cleveland, Ohio where he played in a funk/hip-hop band opening for acts such as Kid Rock, Soul Coughing, Sugar Ray, and Everlast. He also joined a blues band from Akron, OH performing in area venues such as the Rock and Roll Hall of Fame. From there, Corey moved to New York where his musical world blossomed into joining a 9-piece instrumental funk band, a roots rock group, and a Columbia Univeristy jazz ensemble with whom he performed with artists such as Billy Taylor and Dave Brubeck. Once Corey decided it was time to pursue a MBA degree, he moved to Orange County, California and kept his musical pursuits alive by joining Forcefield On (a Long Beach based rock band), the New FBI (a Chicago/Tower of Power/etc cover band), the Foghorn's Lighthouse Big Band, and the Long Beach Community Wind Band. 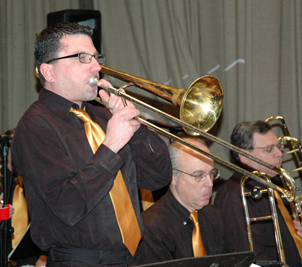 In 2010, Corey's accepted a job transfer back to New York where he promised his wife he would only play in 1 band and was fortunate enough to become part of the Full Count Big Band, which he enjoys immensely.